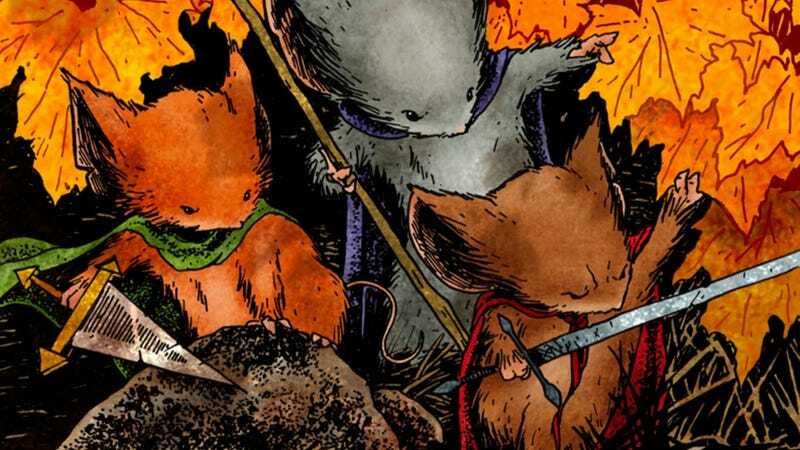 Mouse Guard is an award-winning comic book series, written and illustrated by David Petersen, about medieval mice protecting their own. Last year, a writer was hired to adapt it—and now, a director may actually be turning its lush world of marauding mice into a movie. Deadline reports that Wes Ball, who has spend the last several years adapting The Maze Runner series, is “being eyed” to direct Mouse Guard, which was scripted by Star Wars Rebels and Rogue One writer Gary Whitta. “Being eyed” doesn’t sounds very definitive but, if the news is out there, chances are it’s more likely happening than not. Matt Reeves, the director of War for the Planet of the Apes as well as the upcoming Batman film, is producing the adaptation, which will be made with performance capture, just like his Apes movies. Who wants to bet that Andy Serkis is sought out for one of the leads? He’s been a gorilla, an ape, and Gollum, so why not a mouse? Just looking at the images of Mouse Guard and reading about its almost Game of Thrones-y tale, it has the feeling of a franchise that could sneak up on people. It’s a unique concept with such a dense visual palette that there’s every opportunity for it to be really special—and the people currently involved can certainly get it there.